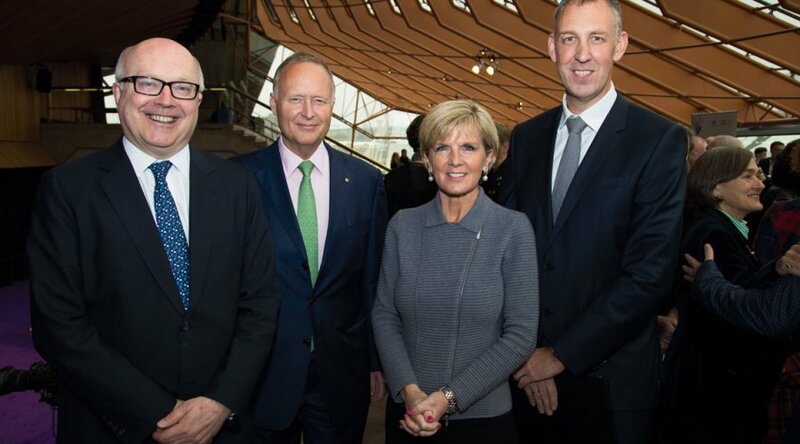 On a stormy Monday morning in August, the Australia Council released its strategic plan for 2015–19 at the Sydney Opera House. Heavy, angled rain battered the panorama of bridge and harbour visible through the wall of windows as everyone in the northern foyer of the Opera House stayed on message: Australia is “a culturally ambitious nation”. The words “funding cuts” fell from no one’s lips. George Brandis, the attorney-general and minister for the arts, told the crowd he wants to support more “creative genius” outside the cities, in regional centres. The council reduced 154 grant-application categories to five; ushered in an “enhanced peer-review process” requiring a “stronger evidence base”; and promised somehow to boost investment in a “significant works initiative” for Aboriginal and Torres Strait Islander artists, all the while broadening the arts’ appeal for children and younger adults in some unexplained way. Julie Bishop, the foreign minister, then strode across the purple carpet to the lectern and spoke of arts as cultural diplomacy. This meant Hugh Jackman, Aboriginal art on exhibition in New York, and the touring Australian World Orchestra. And the ballet. Bishop beamed as she admitted she had no obligation to avoid picking favourite companies. In May, the federal budget had revealed that federal arts funding was to be cut by $100 million over four years. The reshaped Australia Council will operate under a new directive. Its share of the cuts ($28 million) was delivered with a ministerial override that preserves funding for the 28 major performing arts companies, notably Opera Australia, the Australian Ballet, capital-city theatre companies and state orchestras. An additional one-off grant of $1 million was given to the Australian Ballet School in Melbourne. Meanwhile, the cruellest single cut, $38 million, came from Screen Australia’s funding. At a time when Australian films struggle even to be screened in cinemas, the new priorities are clear: filmmakers, visual artists, writers and small arts companies will bear a disproportionate load of funding cuts. Downstairs at the Opera House, I asked Brandis whether individual artists should be concerned. Should individual artists worry they’re being shut out? “No. They’re not shut out,” said Brandis, and looked away. Queensland Theatre Company’s Wesley Enoch criticises his fellow artistic directors who receive substantial government funds but do not speak up for other artists. Quarantining funds at the top end of arts town, he says, “cements in the minds of critics that the larger the company, the more protected they are from the equitable application of policy”. In his essay Take Me to Your Leader: The dilemma of cultural leadership, published in the Platform Papers series in August, Enoch asks: “Where have the rigorous conversations gone? Where is the sense of engagement in public life? … Toughen up, you weak fucks.” Arts boards are becoming more corporate, with a growing concern for quantitative results and risk-accountability, thus becoming “extensions of corporate Australia”, Enoch warns. James Tapscott, a Perth-born, Melbourne-based artist whose light installation was exhibited at this year’s Vivid Sydney festival, is furious that Brandis is investing in “culture as a PR exercise”. Tapscott argues that Australia’s entire cultural future is at risk, with a shrinking cultural ecology for arts companies to draw upon. “The short-term gains look good on paper, and show that our cultural sector is performing strongly, but will surely grow stale as we fill our calendars with productions borrowed from overseas,” says Tapscott. “I’m not against the support of established larger companies, but at the expense of creative individuals, it is detrimental to the development of our cultural identity. Conservative politicians traditionally favour major institutions over smaller organisations and individual artists, says Tamara Winikoff, executive director of the National Association for the Visual Arts. “I think there’s a bit of a ballet affinity,” she says wryly, and notes the extra federal money for the ballet comes after Campbell Newman’s government granted $300,000 in new money to the Queensland Ballet in 2013 for a “Queensland exclusive” tour of Romeo and Juliet. The states and territories, responsible for 47% of government arts spending compared to the federal government’s 33%, have also been cutting arts funding. State and territory arts spending fell $20.7 million between 2011–12 and 2012–13, or from $38.40 per person down to $36.80, according to the latest Australian Bureau of Statistics arts and culture survey, released in June. Two thirds of that spending came from the governments of NSW (29%), Victoria (23%) and Queensland (16%). Yet the 2014–15 state budgets show that these states have followed wildly different paths since. In May, the Victorian government announced $44.9 million in new arts-sector funding, much of which is for upgrades to the buildings of the Arts Centre and National Gallery of Victoria, while the NSW arts budget remained static at $311 million. The Queensland government entered its third year of cuts to arts funding: its 2014–15 arts budget is $223.6 million, down from $231.5 million the previous year. Ongoing cuts by the Newman government are also hitting small and medium-sized arts organisations and squeezing out artists. Philanthropy’s role in arts funding is becoming increasingly crucial. Total revenue from philanthropy, corporate sponsorship and fundraising to the 28 major performing arts companies rose 11.3% to $71.3 million between 2012 and 2013, according to new Australian Major Performing Arts Group figures. Private giving is now five times what it was in 2001, says the group’s executive director, Bethwyn Serow. But lone artists well down the food chain receive little corporate affection. As recent events surrounding the Sydney Biennale demonstrated, individuals risk being ostracised by financial supporters if they criticise the broad business interests of these benefactors. Nine artists boycotted the 19th Sydney Biennale over sponsorship by Transfield Holdings, which owned a 12% stake in Transfield Services, a company that had recently begun to operate immigration detention centres on Nauru and Manus Island. Transfield Holdings board members Luca and Guido Belgiorno-Nettis, whose father founded Transfield Services, ended the family’s 40-year support for the Biennale over protesters’ claims that the family was running “concentration camps”. Senator Brandis retaliated by writing to the Australia Council chair, Rupert Myer, to warn that the Biennale and artists were endangering their government funding: “Artists like everybody else are entitled to voice their political opinions but I view with deep concern the effective blackballing of a benefactor, implicit in this decision, merely because of its commercial arrangements.” The Australian’s columnist Chris Kenny welcomed this as a “muscular, culture-wars intervention”. The Australia Council’s 2014–15 national appropriation is $211.7 million. This is $9.6 million less than 2013–14, and it will drop by a further $6 million per year in each of the following three years. Tony Grybowski, the chief executive of the Australia Council, points out that the council’s national appropriation two years ago was only about $188 million, but was boosted in 2013–14 by the Gillard–Rudd government’s national cultural policy. “We’re still ahead of where we were two years ago,” he says. The council will need to stay ahead. Some companies are telling Creative Partnerships Australia (CPA), a government body that aims to increase private funding for art and culture, that they are “thinking twice” about arts sponsorship after the Transfield controversy. She admits corporate sponsorship tends to support the “big end of town”, but believes there is still potential for smaller arts organisations: Sotheby’s, for example, sponsors artists with disabilities. In the US, with limited government support, arts organisations have to be more assertive in seeking philanthropy. “We are reticent about asking. We’ve got to get over that,” says Menzies. A small number of high-profile philanthropists have set an example: John Kaldor and Simon Mordant in NSW, for instance; Jeanne Pratt and the late Dame Elisabeth Murdoch in Victoria; Andrew “Twiggy” Forrest in Western Australia; Tim and Gina Fairfax in Queensland. But donors in smaller states are proving “really difficult” to find. Tamara Winikoff argues CPA has only been “limitedly successful”, helping major arts organisations but assisting little where there is greatest need: small and medium-sized arts organisations and individual artists. Nonetheless, CPA’s annual $2.5 million federal funding has been renewed for four years. Did artists create a problem for themselves in threatening to boycott the Biennale? Tony Grybowski pauses. “Well, we’re providing some advice to government on that particular issue.” The individual artist is “prime and front and centre of what the Australia Council is all about”, insists Grybowski, who is a classically trained musician. Committed recurrent funding to some 140 key small-to-medium arts organisations “remains untouched”, says Grybowski, but this doesn’t take into account the cuts to the project grants that these companies rely on, and that will also affect artists they work with. Nor that “recurrent” funding may fall if matched funds from the states are reduced. Funding to the council’s visual arts and crafts strategy, regional touring companies, and the 28 major performing arts companies has been preserved. About a quarter of Opera Australia’s $100 million total revenue in 2013 came from governments, most of it ($20.5 million) federal. The largest opera company in the country had 17,415 subscribers in 2014. (The figure for 2013 has not been released because the Ring cycle interrupted the usual Melbourne subscription program. In 2012 and the years before, however, subscriber numbers exceeded 20,000.) The annual Handa Opera on the Harbour extravaganza – La Traviata, Carmen and Madama Butterfly these past three years and Aida in 2015 – is rumoured to cost more than $11 million to stage each year. Opera Australia refuses to disclose how much of these operas are paid for by the principal sponsor, the Japanese entrepreneur Haruhisa Handa, and how much by NSW taxpayers. Symphony orchestras are also government darlings. The Sydney Symphony Orchestra, from whom around 12,000 customers bought almost 24,000 part-year subscription packages this year, received 36% of its $37 million in revenue in 2013 from governments. The Melbourne Symphony Orchestra, meanwhile, is plagued by an $840,000 deficit from 2013, when other performing arts companies are recording modest surpluses, even though governments provided a generous 46% of its $27.4 million revenue. Its subscription package sales, at least, rose from about 11,000 to 12,000 this year. Governments contributed a more modest 16% of the $50.1 million to the Australian Ballet operating funding in 2013 – but with the Ballet School also getting that bonus $1 million. The Ballet’s subscribers are down to 30,330 from 31,921 last year. Not all the big companies automatically get big government bucks. Sydney Theatre Company (STC), the largest state theatre company with $35 million in revenue in 2013, last year got just 9% of its revenue from governments, mostly from federal level. Subscribers fell from 20,176 in 2010 to 15,390 in 2014, although the company has seen a rise in casual ticket sales. Last November, the Packer family gave STC $15 million towards a $20 million renovation of its Wharf complex at Walsh Bay, as part of a new $60 million Sydney Arts Fund from the Packers’ Crown casino profits. It was both the largest single gift ever to an Australian performing arts company and an impressive piece of theatre in its own right. The splash of arts cash seems to have muted criticism that a proposed cultural centre alongside Packer’s Barangaroo casino, with London’s Tate Gallery employed as adviser, has been downgraded from a landmark development to a gloomy, sunless cavern. A second announcement of Packer donations was made this July, totalling $200 million. Half goes to support the arts, including the $60 million already announced, and half to a general philanthropic fund with an emphasis on indigenous education. While Wesley Enoch names the STC artistic director Andrew Upton and his wife and former co-director, actor Cate Blanchett, as being among the few willing to engage with bigger issues – for instance, Blanchett’s support for pricing carbon – it has been suggested that those working in big, secure institutions are sticking to safe artistic choices. Just as Australian films struggle for screens at peak times, there is also a struggle for space on main stages. Australian theatre puts on a “modest and waning number of Australian drama premieres”, argues Julian Meyrick, whose own 2014 Platform Papers essay, The Retreat of Our National Drama, focuses on larger theatre companies. According to Meyrick, the professor of creative arts at Flinders University and a former Melbourne Theatre Company associate director, young playwrights are being neglected. Five playwrights – David Williamson, Joanna Murray-Smith, Louis Nowra, Michael Gow and the late Nick Enright – scripted a “whopping” 24% of Australian drama at nine state and second-tier Australian theatre companies between 1987 and 2013. Australia needs a “non-building-based” national theatre, focused on commissioning and developing work, says Meyrick, who saves his greatest criticism for Sydney Theatre Company. STC classifies 45% of its drama staged between 2007 and 2013 as Australian, but Meyrick says this uses a “generous” definition of “Australian”. Andrew Upton responds: “New Australian writing is just one part of making new Australian theatre.” He says more Australian work has been commissioned, including two new plays to be staged in the smaller Wharf theatres in 2015. Still, change is imminent: Enoch will soon move on from his artistic director gig, as will Ralph Myers from Sydney’s Belvoir St Theatre. Upton’s contract expires at the end of 2015, and he says he won’t accept another three-year term. Melbourne Theatre Company, with almost 20,000 subscribers, got 9.3% of its $23.2 million 2013 revenue from governments. Enoch’s Queensland Theatre Company, with 5755 subscribers, got 44% of its $9.4 million in 2013 revenue from governments. The State Theatre Company of South Australia currently has around 3300 subscribers, and received a high 48% of its $4.75 million revenue from governments in 2012–13, its last audited report. Perth’s Black Swan State Theatre Company got 38% of its $6.1 million 2013 revenue from governments, and has about 2700 subscribers this year. Annual arts festivals in the state capitals, an increasingly prominent part of the arts ecosystem, are also heavily reliant on government funding, particularly from state and local levels. Sydney Festival sold 124,030 tickets for its January 2014 program, with state and local government providing 34% of its $21 million revenue. But Melbourne Festival, with a smaller box office return and 60,000 tickets sold for its October 2013 program, had state and local governments contribute 53% of its $12.7 million revenue. Perth Festival, meanwhile, has become the second-biggest capital-city arts festival, with revenue of $18.4 million this year, selling 195,000 tickets and attracting government contributions totalling 47% of revenue. To all of these figures must be added the large attendances at free festival events. Neither Brisbane nor Adelaide festivals specify how many tickets they sell, although Brisbane, with a $16 million revenue for its September 2013 program, 35% from governments, took $1.5 million at the box office, while Adelaide, with a $2.3 million box office for its February–March 2014 program, got the biggest government boost of all: 60% of $13 million in revenue. But the states and local councils continue to value their capital-city festivals. The pinch will be felt most of all in project-based grants: the Australia Council’s peer-assessed support to the arts category, for which individual artists and small arts organisations already compete fiercely. Brandis has expressed his disapproval of the visual artists who boycotted the Sydney Biennale, but grant-reliant writers and poets will also suffer. According to an Australia Council spokeswoman, the council will spread budget reductions “across all art forms to minimise the impact in any one area”. “We are back into a culture war again,” says Jo Caust, an arts consultant whose clients have included federal and state governments. This year Caust published an essay in the International Journal of Cultural Policy examining Labor’s national cultural policy, Creative Australia, which lasted only months before the incoming Abbott government killed it. In 2014, only three Australian films – The Railway Man, Wolf Creek 2 and Tracks – have passed $1 million at the box office at the time of writing. Australian films comprised just 3.5% of box office national receipts for 2013. Putting aside Baz Luhrmann’s The Great Gatsby, which grossed $27 million here, the figure is about 1%. Compare this to 1986, when Crocodile Dundee and Malcolm took the Australian share to 23.5%, or the almost 10% of 1994, courtesy of Priscilla and Muriel’s Wedding. The few Australian films that break through have hit-making machines behind them, explains Lauren Carroll Harris, who is completing a PhD on film distribution at the University of NSW. Audiences are “rarely given the opportunity to choose Australian films”, she says. Ninety per cent of films in cinemas are distributed by an “oligopoly” of six distributors that are subsidiaries of Hollywood studios – Roadshow–Warner Brothers, Fox, Universal, Sony, Disney and Paramount. Australian films do “particularly well” at the Sydney Film Festival, says the festival’s chief executive, Leigh Small, but this doesn’t translate to commercial success. The major film festivals have become an alternative film exhibition mechanism, albeit a not-for-profit one. Ivan Sen’s Mystery Road, for example, opened the 2013 festival to a packed house, and then was screened in regional centres as part of the festival’s travelling program. The film took a modest $410,000 at the box office on general national release, against its $2 million budget. The Adelaide Film Festival’s director, Amanda Duthie, says festival audiences “heavily supported” Australian films such as Tracks, Charlie’s Country, 52 Tuesdays and Once My Mother at the 2013 festival, but these films also saw mixed fortunes on national release. Matt Deaner, the executive director of Screen Producers Australia, hopes that tax rebate incentives might drive new investment and offset the Screen Australia cuts. Brandis has publicly said he would like “levels of the offset made more generous”, but this may mean doubling the 20% television rebate or increasing the location offset to attract more international blockbusters – as Labor did for The Wolverine – but probably not more tax breaks for Australian features. Risk-averse financial backers can ruin a dream before it gets to the people. Back in 2012, Brian Rosen, former long-time boss of the federal government’s Film Finance Corporation (now folded into Screen Australia), stumped up 30% of the $2 million budget for first-time feature director Sarah Spillane’s Around the Block, a Redfern tale of murder and a riot. Forty per cent came from the film producer offset rebate, and 30% a combination of Screen Australia, Screen NSW and pre-sale funding. Hopes were high. Hunter Page-Lochard, son of the dancer Stephen Page, was “frighteningly good” as the lead, and Madeleine Madden, a granddaughter of the indigenous activist Charlie Perkins, played his girlfriend. American star Christina Ricci drew international interest. In September 2013, Disney International boss David Kornblum offered to add Around the Block to Disney’s Australian cinema schedule. Exhibitors privately doubted the film would put bums on seats. Two mooted release dates came and went, and then silence. So Rosen and his partner Su Armstrong sank $80,000 of their own money into a few cinema screenings, before consigning the film to video-on-demand and DVD. The Sydney Morning Herald called it “rolling the dice with an adventurous plan”. A film’s success should now be decided on “eyeballs” across all platforms, says Rosen. But whether Australians will pay to legally download or rent Australian movies in sufficient numbers to cover the downturn in theatrical returns is an open question. Either way, the industry is in serious trouble. ABC TV commissioned a two-part, three-hour version of the Kate Grenville novel The Secret River, directed by Daina Reid and due to air in 2015. Producer Stephen Luby had envisioned a feature film, with a much bigger budget. Fred Schepisi was signed as director, but marquee actors couldn’t be secured to attract sufficient investment. Some new funding ideas are bubbling through. Actor and playwright Brendan Cowell’s directorial debut Ruben Guthrie, based on his play set in the world of advertising, was twice knocked back for Screen Australia production funding, after getting a small development grant in 2012. Ruben Guthrie began shooting around Sydney in August. In the kind of product placement the market-minded Abbott government would no doubt approve, Ruben, played by Patrick Brammall, will be spruiking a Lexus.